Technobabble is a new video series I thought of back in December 2009. Back then I didn’t have a name for it and only had a vague idea of what I wanted to do in the series. Now I have a name (“Technobabble”) and a bit of a structure for the new video series. HydroponicSearch.com defines “Technobabble” as… Technobabble \Tech”no*bab`ble\, n. technical jargon incomprehensible to non-specialists; — sometimes used derogatorily of discussions using unnecessarily technical terminology and intended to impress or confuse, rather than inform, the listener. 1. They intentionally try to talk down to someone or attempt to make them look stupid. 3. They try to impress by using highly technical terms that normal people do not understand. In reality is someone really impressive if he/she attempts to explain something using technical jargon you can’t understand? 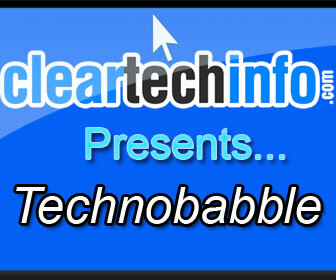 I selected the name “technobabble” for my video series in mockery of the techs I witnessed throughout my life that overuse technical jargon when talking to a normal, non-techy person. I read computer and technology news articles every day. If I see anything that I think a lot of you would be interested in I will talk about the new article. I will also post up a link to the news story in the article associated with the Technobabble Episode (if you can read this then you are currently reading the article associated with the Technobabble video below). Any current or upcoming tech articles, tutorials, websites or projects that are being worked on will be discussed. PLEASE NOTE: If I or anybody else from ClearTechInfo.com recommend or says a certain technology, gadget, hardware or software is the best in category or the greatest thing since sliced bread… You must be aware that technology is currently advancing very fast. In 4-8 months that recommended #1 software, hardware, gadget or technology can be dethroned to #2 or maybe even thrown out of the top 10 entirely.